The bell table by Sebastian Herkner turns our perceptual habits on their head, using the lightweight, fragile material of glass as base for a metal top that seems to float above it. Hand blown in the traditional manner using a wooden mold, the transparent tinted glass base asserts a sculptural presence in space, contrasting intriguingly with the solid brass frame on top while also forming with it a harmonious unit recalling the elegant curving Silhouette of a bell. With its appealing reflective surfaces and contrasting materials, the side table adds a distinctive touch to domestic interiors. 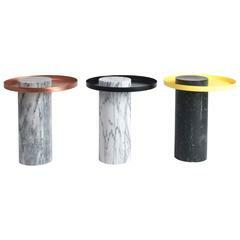 It celebrates the beauty of the materials with their colors and surfaces, along with the virtues of hand-craftsmanship. The bell table by Sebastian Herkner is a masterwork of traditional hand craftsmanship. Each table is handmade, meaning that small bubbles or bumps in the glass are a characteristic feature. Side table. Hand blown glass base. Metal top frame in solid brass. 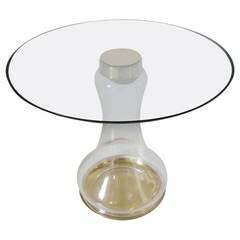 Round crystal glass tabletop, black lacquered, polished and impregnated. Handcrafted. Dimensions: Ø 50 cm, H 53 cm. A late 20th century American side table with an orange shagreen top, chrome x-form legs. The table appears to fold, however, it is stationary. Side table made by Pace Collection, circa 1970s. 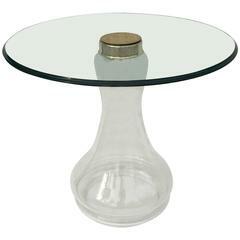 This table consists of polished brass base with a 1/2" thick glass top. New glass top. 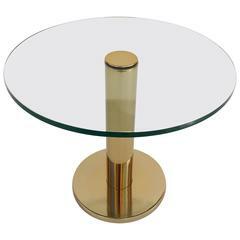 A handblown glass and brass based side table with screw on brass cap supporting a round beveled glass top, a rich and sculptural design retaining labels made by Sarreid Ltd., Spain.